The Track Battery Eliminator System represents our latest offering of flexible, efficient, cost effective DC track circuit products. 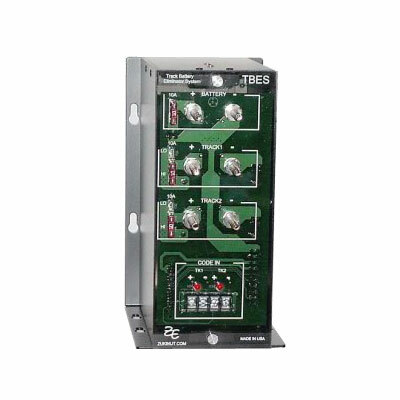 The flexibility designed into TBES takes the form of a family of track interface modules that encompass a wide range of applications. Including short range OS, medium range approach track, Coded and Bi-Polar circuits. Unique to the TBES is the high power output capability specifically designed for low ballast circuits. With its code following capability and compact design, the TBES makes an ideal replacement of code transmitting relays, eliminating burned contacts and lowering maintenance costs. The TBES is field maintenance friendly. The internal modules are plug-coupled to the front panel. You can unplug and remove the front panel without disturbing the house wiring. In addition to accessibility, readily available components are used, such as an automotive fuse. Modular System can be configured to operate with steady state, coded and Bi-Polar signal systems.